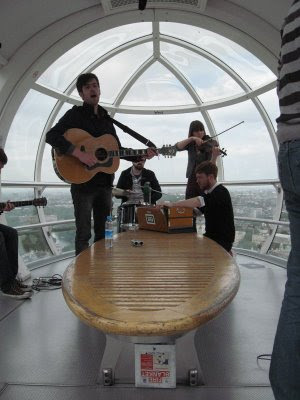 On Tuesday morning I had the pleasure of watching FOUR bands perform on The London Eye. It's not very often I can begin a concert review with a sentence like that! 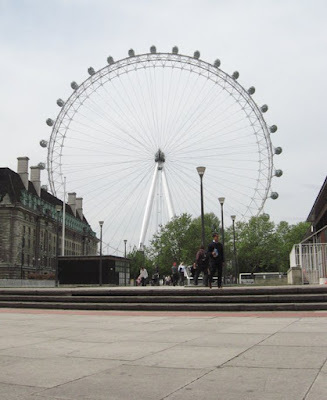 I was supposed to be attending my first ever Tai Chi class but when Kevin Molloy of RockFeedBackTV asked if I'd like to join them at 'The Eye' it was an absolute no brainer. The bands were My Latest Novel, The Low Anthem, Ohbijou and The Acorn. All four are signed to the Bella Union label, all four were fantastic. 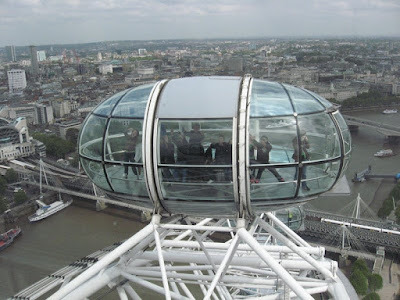 So the basic idea was to get each band into a pod on 'The Eye' for one rotation which is easier said than done when there's a lot of equipment and people and the eye doesn't actually stop for you to get on! This incredibly ambitious feat was achieved and no band members or vital instruments were left behind apart from The Low Anthem's vintage pump organ (apparently bought on ebay for £26) but that was because it just wasn't allowed, shame, that would have been awesome. Each band were filmed playing three songs and some managed to fit a swift interview in but that was usually interrupted by the automated voice suggesting we stand on the designated spot to have our photo taken. After a couple of rotations we all became pretty sharp at predicting when the lady was about to make her announcement, thankfully it wasn't during the filming of any of the songs. My Latest Novel: A mixture of Indie meets Folk. Gorgeous harmonies in 'All in All in All is All' sent shivers down my spine and made me feel a bit wobbly. I kept thinking why haven't I seen these guys live before? Why? Why? WHY?! Brilliant. Most likely to... make me want to sound Scottish. Album: Deaths And Entrances to be released on Bella Union 18/05/09, Album launch concert details here. The Low Anthem: What more could you want than this? Breathtaking vocals that make you pinch yourself to make sure it's real. An absolute pleasure to hear such an intimate performance. Loved them so much I got myself a ticket to last night's gig at The Slaughtered Lamb which worked out to be my best gig of the year so far. Don't live one more minute of your life without having heard these guys. They're playing The Union Chapel on June 23rd, I've booked mine I can't recommend enough that you do the same. 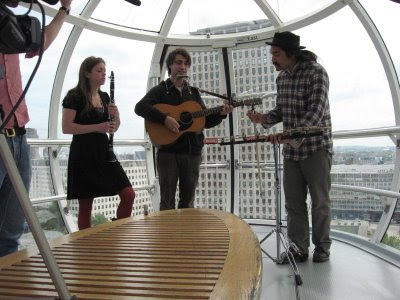 Most likely to... try to get an vintage pump organ on the London Eye, oh hold on they actually did try that! Most likely to... count the pod as one of their instruments. The Acorn: These guys even got the kids in the next pod along dancing, the sort of music you just want to go on and on. 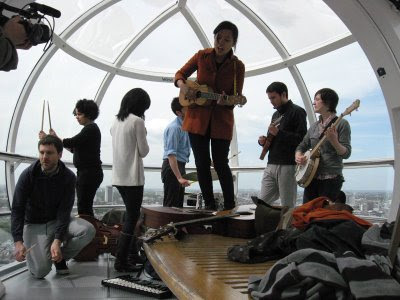 I enjoyed watching one of the band members in an 'egg shaker trance' looking out over London. At the end we all just stood there blown away. So there you have it, so much more intimate than listening to your ipod watching four amazing bands from a dizzy height with the hustle and bustle of London slowly drifting by. It doesn't get much better than this. 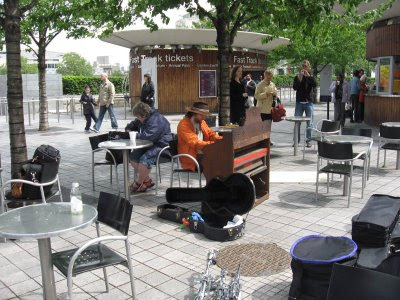 I can never go on the London eye again without musicians playing, it's soo much better! 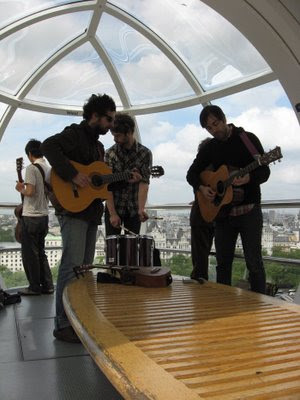 Big thanks to RockFeedBack, The London Eye and to all the musicians who made it happen. Please do it again! Great review. I was also at the lamb..
Just checked out your review, spot on, plan on writing mine today, bit behind! Was a great concert wasn't it.